A little round up of what's been grabbing my attention around the internets lately, amongst the blogs and the non-blogs alike. First stop at a new food blog, Tea and Cookies, where a certain Ms.Tea meticulously documented her farcical –if also a little alarming- descent into food blog madness. Make sure you swallow whatever you've got chewing before you read it. I don't want to be responsible for anyone choking or anything! The next stop shows us a very pretty new(ish) blog, Harriet's Tomato, whose recent post touched on two of my favorite things: British farmhouse cheese and who else but the lovable Wallace himself. Come to think of it, if my TV wasn't buried somewhere in the mountain of boxes, and Neals Yard wasn't so far away, I wouldn't be typing up this post now. Instead you would find me parked in front of the tube watching the latest Wallace and Grommit adventure while munching on a good wedge of Lancashire Poacher or Stinking Bishop. How did I find out about these new blogs, you asked? Why, I am not such an egoïste that I technorati myself on a regular basis! What a preposterous idea! Not on the blog circuit, there's the piece by Rachel Cooke in the latest Observer Food Monthly that got my eyes tearing up on this drizzly morning. She reported on the miraculous recovery of Fergus Henderson, arguably the most beloved cook in Britain. Fergus was diagnosed with the debilitating Parkinson disease in 1998, and every St.John regular has been a witness to his deterioration, which had all but taken him over by the time I last saw him in London. See this pretty photo? This is what means by stalling. 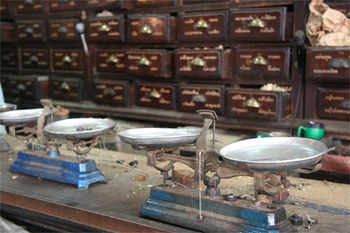 I'm not going to tell you the story of this hundred year-old apothecary in the old part of Bangkok yet. I'm just putting this photo up here since it looks good, and it will likely sits on the top of Chez Pim front page for a few days. I will tell you, though, that the mystery chefs were indeed Alain Passard and Daniel Boulud. The first photo, of Passard alone, came from the kitchen at the site of the $5,000 a plate 'Rarities Dinner' at the Masters of Food and Wine in Carmel. David did the amuse, while Alain and Daniel did the main courses. Larry Stone, Rajat Parr and a long line of fancy sommeliers poured the wine. My memory is quite hazy but I do vaguely remember '00 (that'd be 1900, not 2000) Mouton and '00 (same here) d'Yquem, among others. 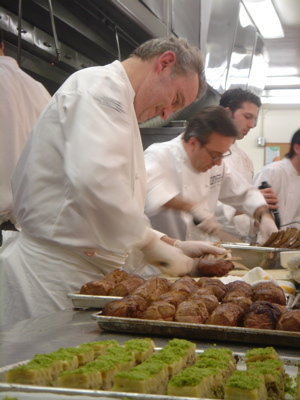 The second photo, with Daniel Boulud, was taken at the main kitchen of the Highland Inn, the site of the Masters. There are, of course, more where that came from. But it might be a few days before I dig myself out of this mountain of boxes. It will be worth the wait though: that I can promise you. 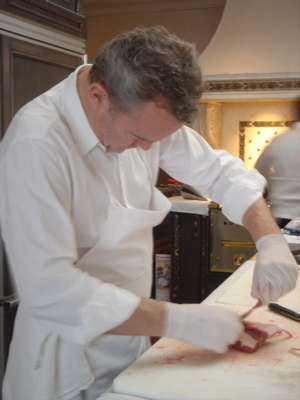 So, yes, the first mystery chef was Alain Passard. But, no, the lamb he was trimming wasn't Agneau de Sisteron. More like Agneau de Pensylvania. It's a rare occasion when I can motivate my very own lazy bum to post twice in a day, but this is so, well, fun, that I just had to. This morning Steve Cuozzo at the New York Post published a seriously scathing review of Del Posto and Morimoto, by Iron Chefs™ Mario Battali and Matsaharu Morimoto, respectively. It appears -to the good M.Cuozzo at least- that these Iron Emperors are flashing their bare naked arse to the whole wide world. Complaints range from 'indifferent cut of sushi' served of hot plates, to signature dishes 'short enough on seasoning for convalescent fare', to ice cold zabaglione from Del Posto, where diners were given '[p]illows for purses but bistro plates for pasta'. But the fun didn't end there. No, no, it really hadn't even begun really. Not until I popped over this morning to the popular food forum eGullet and found this little -shall we say- rant. …and there is more where that came from. Another snapshot of a Thai dessert from my trip to Bangkok a couple weeks ago. These little colorful bits are called Look Shoop, which is roughly translated as 'dipped balls'. No, I didn't make that up. I swear. Presumably the name came from the process of making the desssert. 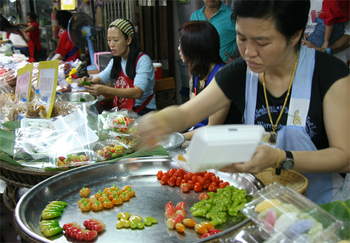 The little balls (look in Thai) made of sweetened yellow mung bean paste are formed into miniature fruits, painted bright colors, and then dipped in agar-agar (dipping = shoop in Thai) to make them shiny like in the photo. Unlike the other desserts I've rhapsodized about earlier, this Look Shoop stuff I am not so keen on. They are pretty to look at, just like marzipan, but don't exactly taste like much by themselves, you know, sort of like marzipan. Michelin France 2006: 'The Red' is done! Last Friday, Libération, the Paris paper, published a scoop on the new Michelin guide for France 2006. The biggest news, perhaps, is the awarding of the –long awaited and highly deserved- third star to Oliver Roellinger in Brittany. Shall I just say I told you so? Frankly I am not sure what has taken Michelin all this time, Roellinger has long been acknowledged by his peers –the likes of Troisgros and Gagnaire with plenty of stars to their names- to have earned his proper place amongst the best of them. But then again, Michelin appears to have a lot of catching up to do. That's probably why I wasn't particularly surprised to see that Yannick Alléno did not get his third star, despite the fact that Le Meurice has consistently been performing at the three-star level. I'm not even the only one believing so, Vincent Noce who wrote the Libération scoop said as much himself. While snubbing the new generation, such as Alléno, Piège, and Frechon (who is not my favorite), Michelin seems to have changed its mind on the issue of chefs with multiple restaurants. Gone are the days that Alain Ducasse had one star taken away from a restaurant merely because he opened another that also received three stars -legend has it that back then Michelin didn't believe a chef could consistently support two three-star establishments. Michelin of today, however, appears to be on the side of the empire-building chefs. Joël Robuchon has gotten four stars altogether from his growing fiefdom that stretches from Paris to Monaco (Michelin doesn’t rate the one in Vegas). Pierre Gagnaire took over Gaya since la rentrèe last year and promptly receives one star on this guide just a few months later. On the strength of the signature bearing the name of Alain Ducasse on the purchase contract alone, Benoît gets to keep its long-endangered star, even if the ink has barely dried and Ducasse hasn't even taken over the operation yet. Change is the only constant in life, I suppose. 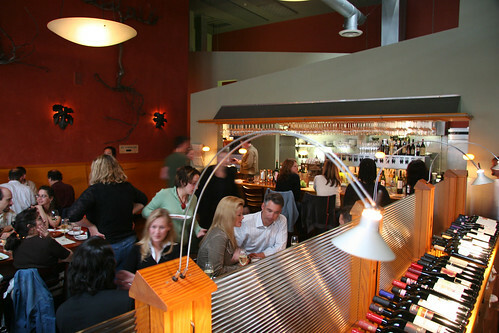 Would you believe me if I said the most sophisticated wine bar in the Bay Area is not in the city at all, but all the way down in Santa Cruz? I was introduced to Soif by David, who had been waxing poetic about this hip little place ever since we met. Frankly, my-city-snob-self wasn't so convinced -hip and Santa Cruz not being particularly compatible in my vocabulary. Imagine my surprise when I was taken to a neat space that could have been at home in the Mission or SOMA, and found a menu that featured a flight of the obscure traditional Burgundian grape variety, Aligoté? Not just any old Aligoté, mind you, but those from famous producers like Ramonet, Arnaud Ente, Jayer-Gilles, and Aubert de Villaine! I could hardly believe my eyes, or my palate, for that matter. When the Portuguese arrived in what was then the Kingdom of Ayudhya (the predecessor to the Kingdom of Siam, which is Thailand now) in the early 1800's, they brought with them many culinary techniques that would remain until today in Thai cuisine. Perhaps the strongest influence was in dessert making, where Foy Thong, Thong Yip, Thong Yod, and other desserts made with egg yolks cured or cooked in syrup remain in the forms recognizable even in today's traditional desserts in Portugal and some parts of Spain. 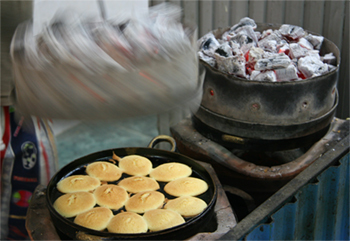 The Portuguese also left a primitive form of oven baking with the Thai, as seen in this particular dessert in the photo above. 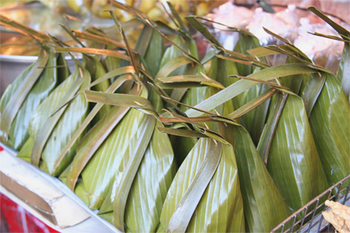 It's called Kanom Kai (Kanom means, simply, desserts, in Thai, and Kai means eggs). It's made of egg and sugar, beaten together into a cake-like batter, then baked in a cast iron pan with ridges (like the back side of a Madeleine). The pan is heated over a charcoal fire, with more smoldering charcoals filling the lid of the pan, providing heat from bottom and above.